Start of Summer salad, recipe below. I read about a program recently called “Give it 100“, where you promise to practice something every day for 100 days and see major results. I’ve seen varying degrees of this program throughout the years- 30 day detoxes, 16 days to awesome abs, 3 week sugar cleanses, etc. At least for me, these programs have never worked. Mostly because I cave after day 2. That’s why I love committing to a 3 day challenge. You want to give up after 2 days, but it’s possible to stick it out just one more day. And 3 days is enough to encourage some beautiful changes- in your diet, in your exercise routine, in your general outlook on your health and wellbeing. I’m going to focus specifically on my diet over the next three days. My goals: Healthy, nutrition-packed, clean meals. No heavily processed sugars, alcohol, or processed carbohydrates. You can follow my journey on Instagram @rosewoodhealth, where I’ll be taking pics of everything I eat (fascinating, I know). I’m starting today, and will give an update Sunday evening on how it went. Interested in joining me? Share what you’d like to focus on for three days in the comments below, along with your instagram or other social media account- it helps to hold yourself accountable. Make a pledge with your partner or friend to do it with you for extra support. Beets are amazing this time of year! Three heads of kale, 2 cups roasted beets and carrots, 1 cup cooked red quinoa, grapes, mustard vinaigrette. Take 3 heads of your favorite dark leafy greens (kale, spinach, romaine, beet greens…) and wash and dry well. Add: Cooked vegetables of choice. We used roasted carrots and beets! Preheat oven to 400 degrees, throw chopped vegetables in a pan with olive oil, salt, and pepper. Once all ingredients have cooled, mix together in large salad bowl. 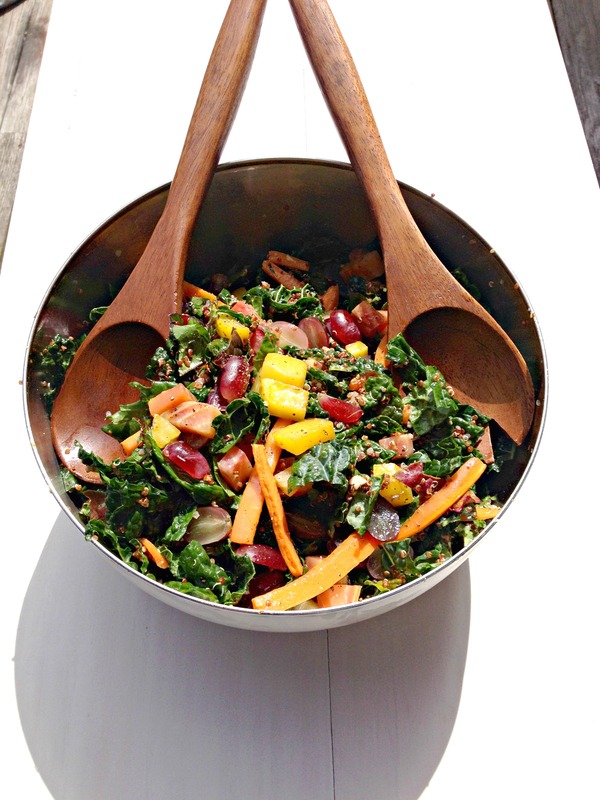 If you use kale, feel free to dress this salad ahead of time, as it only gets better the longer it marinates. We used a dressing of 1 TB mustard, half olive oil, half apple cider vinegar, and splash of maple syrup.